estination spas tend to have distinct personalities. 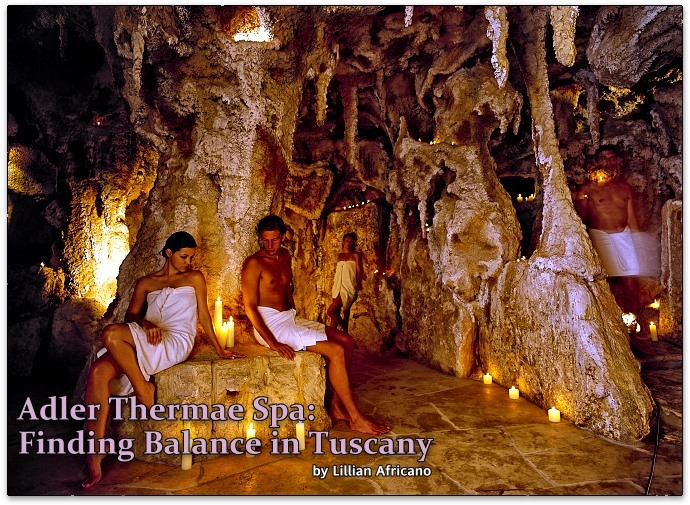 The Adler Thermae Spa Resort in Tuscany presents as a five-star hotel with a medical spa offering luxury without glitz and service without pretentiousness. There are 90 rooms and 120 staff, a very nice ratio for guests. Though the resort is relatively young—it opened in 2004—it closes every January for four weeks of maintenance, cleaning, painting and general refurbishing, so that everything feels new when it re-opens. 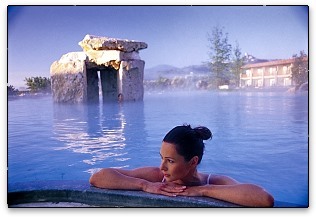 The world of Adler Aquae includes: an indoor thermal pool at 36° C (96.8 F°); an outdoor thermal pool at 36° C (96.8 F°); a sport pool with fresh water at 28° C (82.4 F°); several facilities with Jacuzzi; a “wild river” water stream; a children’s pool at 36° C (96.8 F°); the “Argillae” Rasul Mud bath; the “Artemisia” herbal steam room; the “Salino” Etruscan salty steam bath; the “Olivae” olive-wood sauna; the “Grotta del Filosofo” steam bath in the Travertine Grotto and the “Grotta Salina” underground salt bath. Dr. Thomas Platzer, Adler’s resident physician, explained that the water circuit here is not generic, as it is in some spas. Guests are advised to use the various saunas and steam rooms according to need, age, physical condition and blood pressure. The Artemesia steam room, which is designated “ladies only” from 2 p.m. till 6 p.m. is scented with a fragrance like Herbes de Provence and employs changing lights for chromotherapy. The Salino is set at a lower temperature and emits salty steam. According to Dr. Platzer, the Finnish Sauna, Olivae, can build the immune system and flush toxins. Outside is a natural lake, where guests can take a plunge after using the sauna. In fact, the doctor added, it is best to alternate cold and heat, a cold shower to contract the muscles, steam to relax and open; this process, he said, kicks up the circulation and brings in more oxygen. There are two versions of the Adler Balance program, one that runs a week (1,027 Euros) and includes full board with the Balance menu; and one that takes just four days (Sunday through Thursday) and costs just 762 Euros. The short version includes three medical check-ups, four Balance massages, three detoxifying baths (two with salt and one oligobath), one algae wrap, two Aqua Detox, one facial treatment, two fitness classes, evening conferences with the doctor and full board with the “Balance” menu. There were classes in Nordic Walking, but I preferred to walk on my own and explore the area. One refreshing walk was to the village of Bagno Vignoni, where the Romans took the waters—and where the Medici Prince Lorenzo the Magnificent and Pope Pius II both sampled the waters at the famous thermal baths along the Via Francigena, the ancient pilgrim route that once led from Canterbury to Rome. In addition to the classes, Adler offers all kinds of excursions, including horseback riding, mountain bike trips and tastings of Pienza Pecorino cheese and Tuscan olive oil. I spent a delightful day in Montalcino, sightseeing, window-shopping and visiting the Pian Dell’Orino vineyard, where I tasted (and later purchased) some superb Brunello wine. Sad to say, I missed an excursion with the tantalizing title “The Scent of the Truffle” because I was leaving the day it was offered. Not only did the program include a walk in what was once a Roman settlement, it also featured a tasting of the white Tuscan truffle. The day begins with a lavish breakfast buffet that features fresh juices, yogurts, breads and croissants, muesli and cereals, cheeses, sausages, eggs and daily specialties. Lunch includes hors d’oeuvres, salads and cold and warm dishes such as grilled fish or meat. Dinner menus feature four to five courses in addition to a buffet of salads, cheeses, breads and desserts. There is always a choice of Fitness and Health low calorie menus or personalized diet programs. And then there are the spa treatments, a tempting menu of offerings designed not only to improve and enhance well-being, but also to pamper. My first treatment was the 45-minute Relaxation Massage (58 Euros) with Claudia, who started with my feet, working the toes and the soles, using a relaxing essential oil to counteract the drying thermal waters. Working up the legs, using a flat hand, she interspersed the massage motion with gentle rocking and stretching--my face, my head and even my hair. 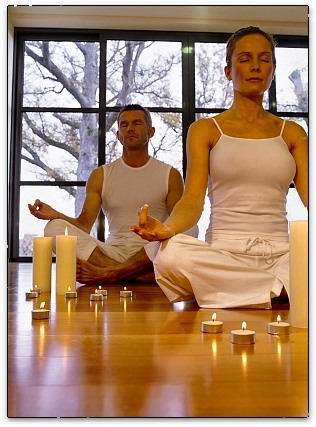 The movements seemed to stroke away stress and when the treatment was finished, I was feeling lighter, buoyed up. Even before Claudia served me some relaxation tea, I knew that this particular massage had been the perfect cure for my jet lag. My next treatment, the following day, was the Sangiovese Red Grape Facial (55 min., 88 Euros) with Marika. I had read that the anti-oxidant and anti-radical properties of the red grape would refresh and replenish my skin. The facial began with a cool cleanser followed by a warm towel to remove every trace of makeup and product from my skin. A toner and another warm towel prepared my skin for the grapeseed facial, which Marika pressed into my skin. Later, after a lovely massage that included the décolleté area, the mask was peeled off. Another mask was applied, this one with anti-aging and hydrating properties. When that was removed, Marika finished the facial with a day cream—and instructions to stay out of the steam rooms and saunas for at least an hour. No problem, I thought, after I looked in the mirror and saw that my skin was glowing. I headed for the inviting relaxation area with my glass of water and stretched out on a lounge to prolong the luxury of doing absolutely nothing. 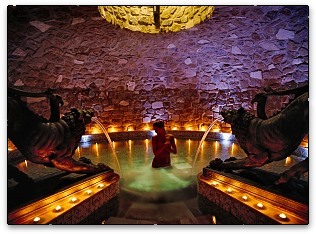 My final spa experience was pure indulgence, a one-hour pedicure (47 Euros) with Michaela. I love a good pedicure and this one had me seated on one of those posh thrones with bubble jets that massage the feet. Michaela did some manual massage before the usual nail prep. The buffing was done with an electric gadget; it was followed with an application of sesame oil, then Guinot cream and more massage. 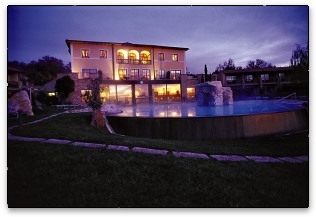 The gold polish I’d chosen seemed to match the way I felt: my Adler Thermae experience had been pure gold.